Former Manchester United and England footballer Phil Neville has apologised for a string of sexist and misogynistic tweets. The messages came to light after Neville was named England named coach of the England Women's team. Neville joked about beating his wife in the tweets, while suggesting women should be confined to housework and blasting those who pursue equality. However the former full-back has now apologised, saying the tweets "were not and are not a true and genuine reflection of either my character or beliefs”. Neville, who won the treble at Old Trafford before moving to Everton and has since coached United as well as Spanish side Valencia, was named the permanent successor to Mark Sampson, who was sacked last September. However, shortly after he was named as the new head coach, a historical tweet posted by Neville in 2012 caused a Twitter storm. The tweet read: "Morning men couple of hours cricket be4 work sets me up nicely for the day." When asked why he only referred to men in his post, Neville replied: "When I said morning men I thought the women would of been busy preparing breakfast/getting kids ready/making the beds-sorry morning women!" 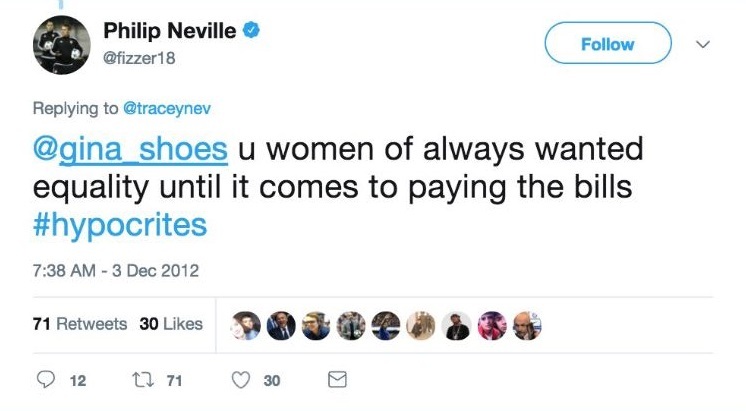 Another tweet by Neville, sent to his sister Tracey, read "u women of always wanted equality until it comes to paying the bills #hypocrites [sic]." Neville has apparently removed his Twitter account, @fizzer18, which is no longer available to users. Neville replaces Sampson, who was accused of racism by England striker Eni Aluko, although he was eventually sacked for "inappropriate and unacceptable behaviour" in a previous role with Bristol Academy. That prompted the FA to turn to England U19 coach Mo Marley as a caretaker manager and she led England to a 1-0 defeat by France in a friendly in October and two convincing World Cup qualifying wins over Bosnia and Herzegovina and Kazakhstan. England Women's next qualifying game is against Wales in Southampton on April 6.